I'm trying to design a simple circuit that has the ability to charge a single cell Li-Po battery and can be used as +5v power source. I chose the circuit from here. It seems that when VUSB is active, the +5V pin would select the VUSB instead of the step-up regulator because of two Schottky diodes, and the charger chip would charge the battery at the same time. When the VUSB pin disconnected, the charger would go off obviously and it seems that the EN pin of step-up would go high (Why?) 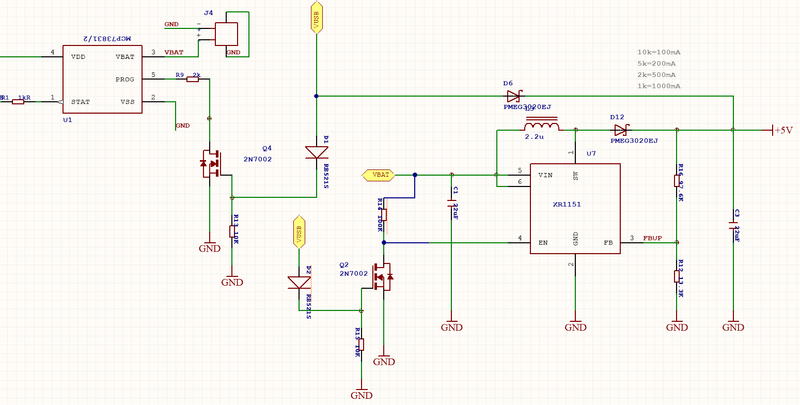 and enables the regulator, then the +5v pin selects the output of the step-up regulator. My first question is what is happening to FET switch? My second question is, does this circuit protect the LiPo battery from under-voltage discharge? For example, when VBAT goes below 3.2V. I'm using a different step-up regulator (AP3031) and I think I should calculate a different value for R15. EDIT: here is the second schematic to make sure step-up regulator become active only when VUSB is off. My first question is what is happening to FET switch? As far as I can tell, the idea is that VUSB applied to MOSFET gate through D1 should open it, pulling PROG to the ground and enabling charging (2k resistor sets charging current to 500 uA), while at the same time disabling step-up via EN pin. When VUSB removed MOSFET closes and this supposed to enable step-up and disable charging. I don't think it would happen, though. AP3031 requires logic "High" to enable, and there is no pull-up on the input. On the other hand PROG input should be left floating to disable, so you cannot just add pull-up there. My second question is, are this circuit protects the LiPo battery for under voltage discharge? There is no discharge protection in the circuit whatsoever, not under-voltage, nor over-current/overheating. MCP73831 only manages charging. You can use battery with built-in protection PCB. What I also don't like about this circuit is that step-up regulator is connected to battery directly. This can affect charging profile with unknown consequences. UPDATE: Have you considered using more sophisticated BMS like MCP73871 ? It has all those MOSFETs and diodes inside the chip itself. All you have to do is connect your step-up (including EN pin) to "system load" output.